Late Sunday afternoons spent with Alex are one of my favourite things to do. 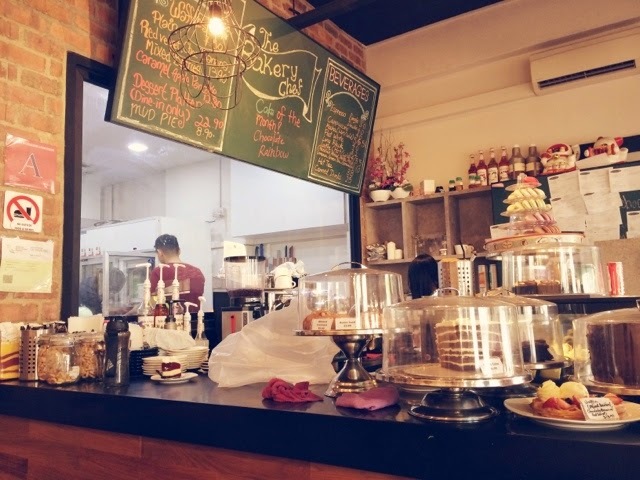 We'd go in search of cafes around our sunny little island, unwinding over a nice cup of coffee and slice of cake. Its nice to just enjoy the comfortable silence and the ambience. These Sundays are precious cos they only last from May till October before I start working till late at night on weekends which only leaves us with weekdays. 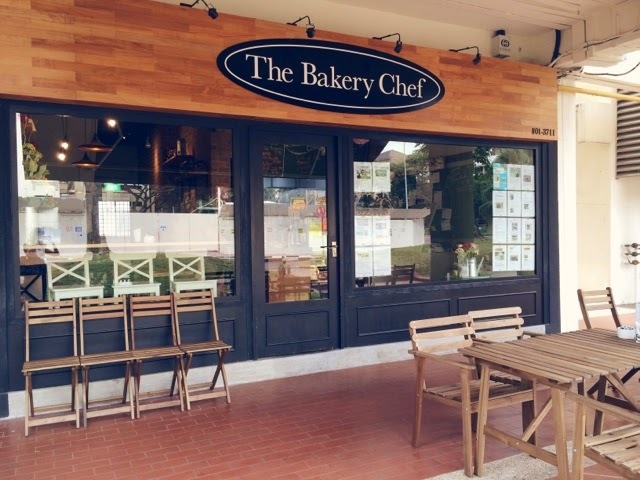 Anyway, we checked out The Bakery Chef at Bukit Merah Central cos my mom recommended their rainbow cake and we've also read some good reviews about their red velvet cake. 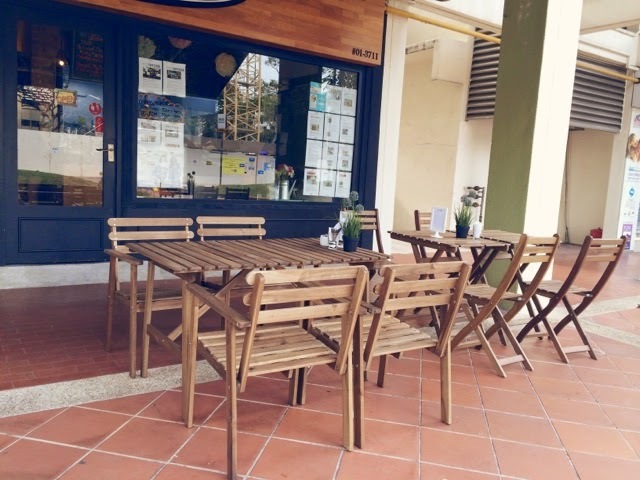 The 'woody' exterior of the cafe looks inviting and it definitely stands out among the other shops along this stretch of HDB flats. I do enjoy seeing a little pop of modernism amidst nostalgia here and there but I just hope it doesn't change the entire 'feel' of the place. That means more yummy cakes right? I really like the colour scheme of the front counter and cake display. With so many choices to choose from, which ones shall we pick? 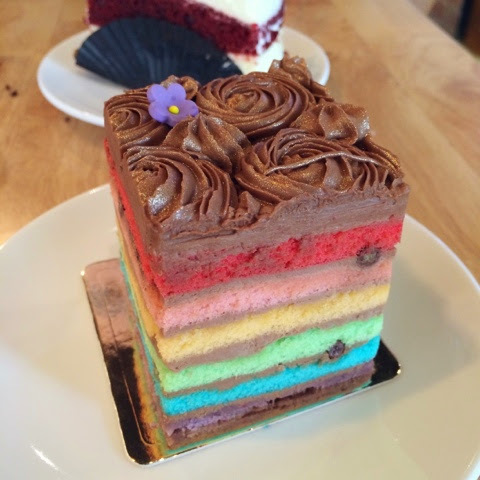 The 'special' cake for that week was 'CHOCOLATE RAINBOW', shall we go for that? Or the normal rainbow which is equally pretty? 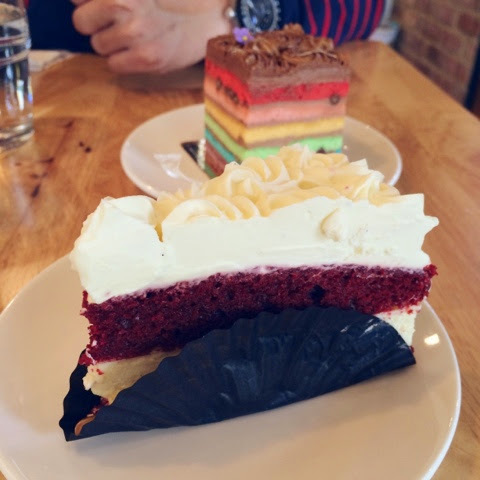 We finally decided on the Chocolate RAINBOW Cake and Red Velvet! There were also chocolate bits in between the layers. we decided why not just give it a try? Like no other red velvet creations I've tasted. It was delicious, the taste of the cream cheese and the red velvet sponge went so well together! The sponge cake portion was light and fluffy, not dense and heavy like some others I've tried previously. I'd recommend anyone who's going to check out this cafe to try their red velvet cos we are definitely gonna go back for more!